There has been much conjecture about the history of Brook House, situated at the southern end of Duck Street. It has leaded light windows common to late 17th century homes, and it was thought it may have been a long house, that is, built to house family and animals under one roof However more recent research suggests that it may have been the "new messuage in Tytherington with outhouses, buildings, courts, backsides, garden, orchards and appurtenances and the close adjoining Kendalls Close and two closes..." bequeathed to John Hawkins in Ann Briard's will dated 4th April 1752. The Tithe Award map of 1839 shows that the house was a pair of semi-detached stone cottages with the northern cottage larger than the other. The house was owned by William Pullen, who had moved away from New House Farm to Itchington, but retained a few properties in Tytherington. The larger of the two properties was occupied by a Miss Buller, who may have been a spinster survivor of the Buller family who had lived not long before at the extreme south of the parish bordering Earthcott (now Meadow View). 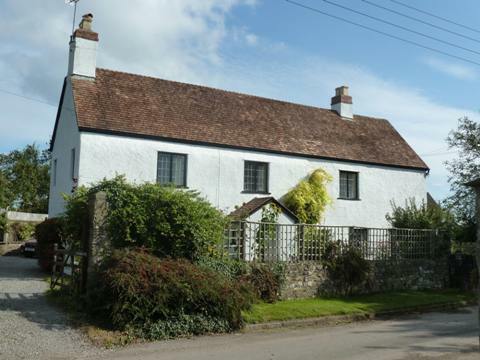 The smaller property was occupied by John Matthews (agricultural labourer) and his wife Ann. The rent for both plots was 4s 6d with a total acreage of 2 roods and 12 perches. The 1841 census shows that William Pinnell was the tenant; he died young, age 30, in 1846, leaving his widow Sarah and his mother-in-law, also Sarah, in occupation until the '50s. Then she married Halsey, middle of the three sons of widowed Mary Russell who, together, were working Mill Farm next door. The couple lived on in Brook House until Halsey died in 1881. In 1841 the other tenant was still John Matthews and his wife; with a George Matthews. It maybe that it was George who desecrated the grave in the vault at the burial of the squire Thomas Hardwicke in 1841. By 1861 the Russells were still in residence, but Charles Hendy, wife Jane and three children William, Annie and Charlotte were in the other cottage. In 1857 their daughter Charlotte was born, while along the road at Hawkins's George Brown was a little boy of 2; in 1880 George and Charlotte were married, and set up home with Jane, now a widow and making a living as a stay-maker. George and Charlotte soon moved to The Old Manor House (still occupied by a descendant), Jane remarried, to Richard Livall, a widower, and lived on until 1915, aged 81. By 1871 the Hendy's children had been replaced by four lodgers, railway labourers working on the Yate to Thornbury branch line. Work on the line began in 1867 and was opened in 1872. Many houses in the village had lodgers working on the railway at this time. For a brief period in 1867, Sarah and Halsey gave house to the Misses Pullen from Itchington. These spinster sisters of Samuel Cox Pullen at The Laurels left home when their brother married, and made a brief stay at Brook House. Later, after Halsey died in 1881, the sisters moved back; Katherine died in 1898, her older sister Harriett in 1907. The 1891 census shows the two sisters living in the house with Elizabeth S Tyler 64 of Tytherington, companion, and Ada G Perry 18, general servant and domestic. The 1901 census only identifies one property called Mill Cottage, listed as uninhabited but in occupation. 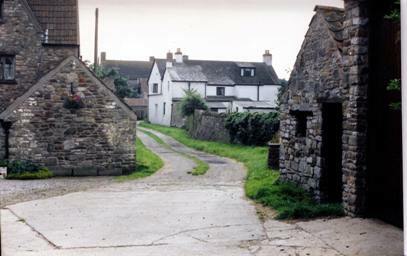 It may have been at this time or later that the two cottages were converted into one dwelling. In 1911 one property is listed as having six rooms occupied by James Limbrick (80 retired farmer born in Hawkesbury), Sarah Limbrick his wife, and Alice 48 their daughter. Mrs Harris occupied the house after the first world war, and at some stage it was owned by Edwin Tressider Christian Fear (Captain of s.s.Flavia in 1921 when awarded the Order of Christ by the President of Portugal). Herbert John Young occupied Brook House until 1935 and then Mr and Mrs Hollingworth. After her husband died in 1943, Mrs Hollingworth, a powerful character in the village, lived on in Brook House until she moved into a bungalow Hoggersgate, now Green Pastures, which she built on part of the land. She died in 1969, and was followed for ten years by Mrs Hill, mother of Francis Hill at The Manor. James Page (1974-77) John and Sue Harbottle (1979) and Robert and Hilary Jenkins (1993) succeeded Mrs. Hill.